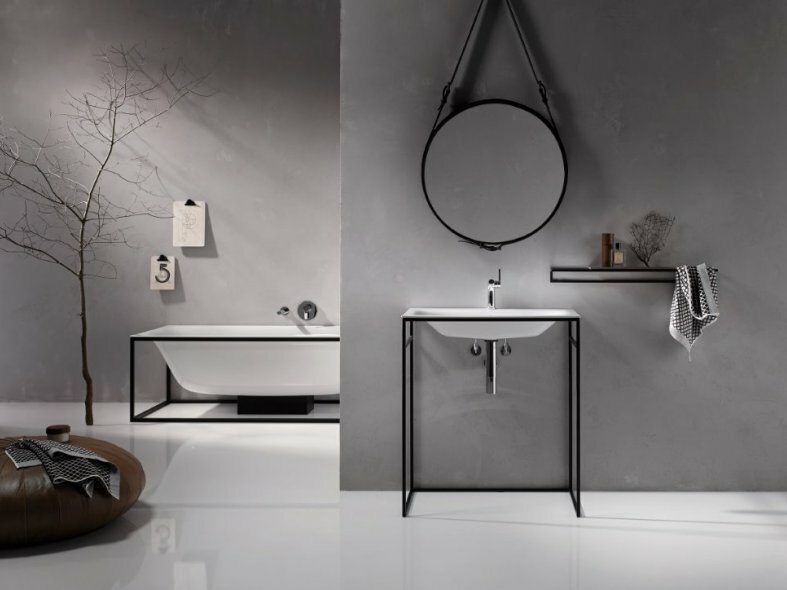 The BetteLux Shape from German enamelled steel bathroom manufacturer, Bette, is a new concept in baths and washbasins and has already won 6 design awards. The BetteLux Shape range places the soft and flowing shape of the BetteLux in an open steel frame, with the bath enamelled on both the inside and the outside. This allows the eye to focus on the shape, which is visible from all sides and is accentuated with a choice of colours in the steel frame. The range also includes enamelled steel washbasins in an open steel frame and enamelled on both sides, along with complementary furniture and accessories. The design is by Tesseraux & Partner. The BetteLux bath was the first made of enamelled steel with a soft, flowing inside and an extra-flat bath rim, however, its innovative shape could not be fully appreciated in many installation scenarios. The new range is designed to focus on the shape and takes inspiration from skeletal 'inside/outside' constructions in modern architecture. In interior design, only a few materials allow this 'inside/outside' approach, and only a very few of these allow it to such a radical extent as with the BetteLux Shape. 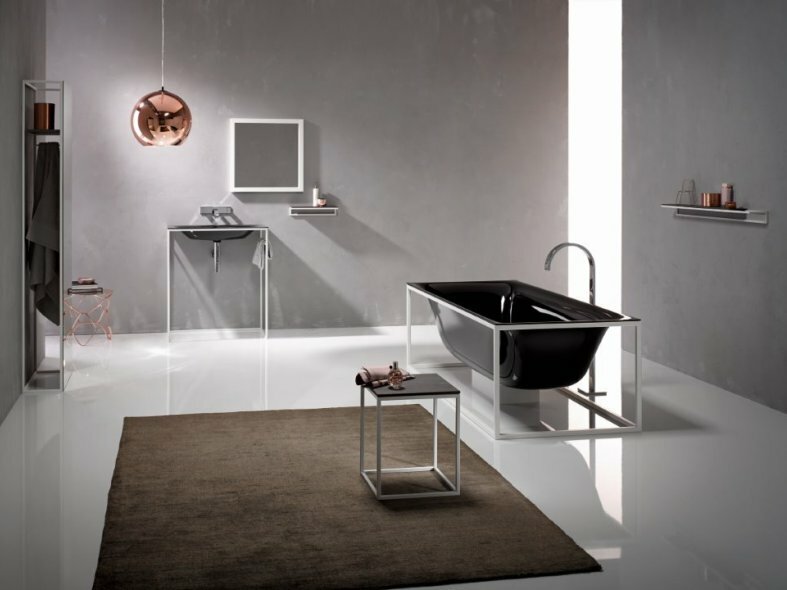 Instead of baths and washbasins being covered, they take centre stage with a design technique in the form of a steel frame, which supports them. The steel frames present the bath and the washbasin in their purest form and also provide design options via a well thought out colour concept. 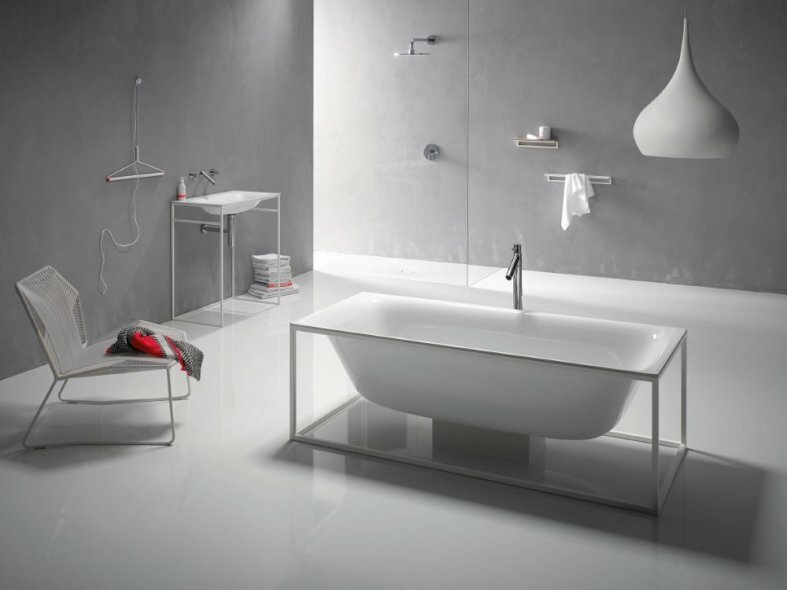 The powder-coated support frames are available in a choice of six colours and the bath is available in black and white. 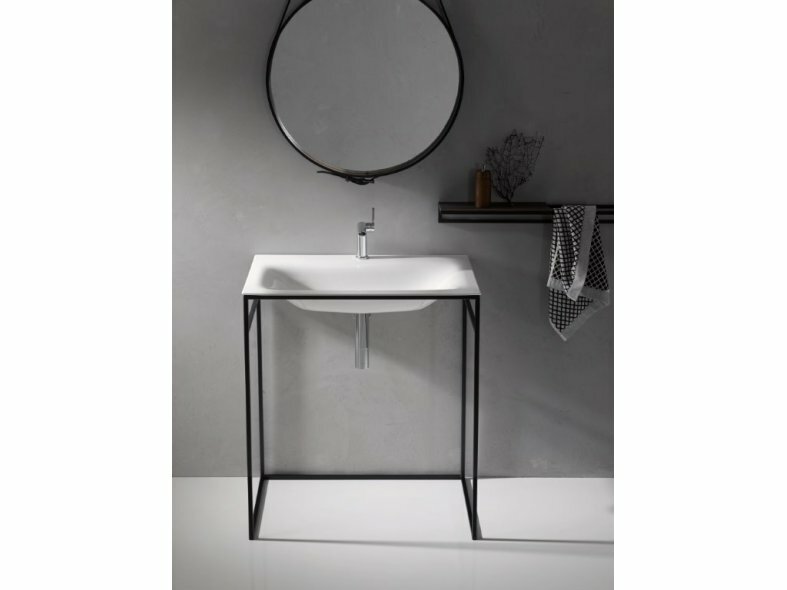 Bette has developed a furnishing concept around the BetteLux Shape, with washbasins and useful accessories also embracing the frame idea, allowing a coherent and uniform bathroom design. 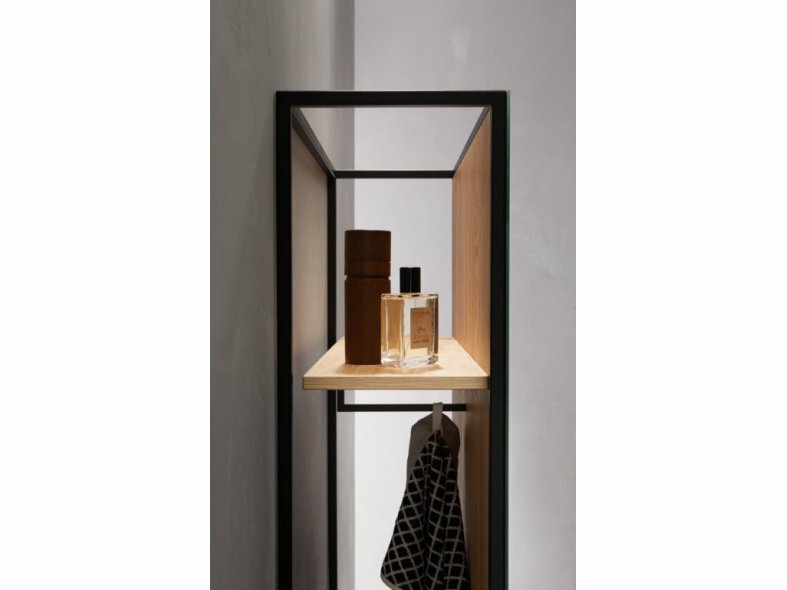 In addition to a framed bath and washbasin, the range includes a standing mirror, a stool (which can also be used as a side table) and a wall-mounted towel holder to which various shelves can be added. Managing Director Thilo C. Pahl comments: "The steel frame fits perfectly with our preferred material of steel/enamel and with our philosophy of creating a surface that impresses in every way and from every angle." The composite material steel/enamel allows this type of construction because, despite its thinness, it is very stable and, even in this installation scenario, will not warp under load. This construction is indicative of everything that defines steel/enamel; its stability allows Bette to create an elegant shape and perfection in the detail, with Bette delivering a flawless surface on both sides. The elegant and open design of the bath leaves no room for surface compromises and also means that the functional attachments must satisfy strict aesthetic demands. This demanded a new water drainage and overflow solution, as a bath of this type cannot have a visible overflow. A completely new system was developed in collaboration with the specialist drainage company Viega. Even without an overflow hole, this ensures that there can be no bathroom floods. To achieve this, the water column in the bath is constantly monitored electronically and, if the column rises above a defined level, a valve opens the drain for 15 seconds. This permanently regulates the level to which the bath can be filled. The new type of system is installed under the bath in an aluminium housing of a coordinated colour, requires an electrical connection and has a back-up battery that ensures power cuts can be safely bridged. Bette managing director Thilo C. Pahl comments: "We experimented with mechanical and hydraulic solutions, and rejected them as being too unreliable. High-tech really does benefit the customer here - with BetteLux Shape, there's neither overflowing nor a visible overflow."